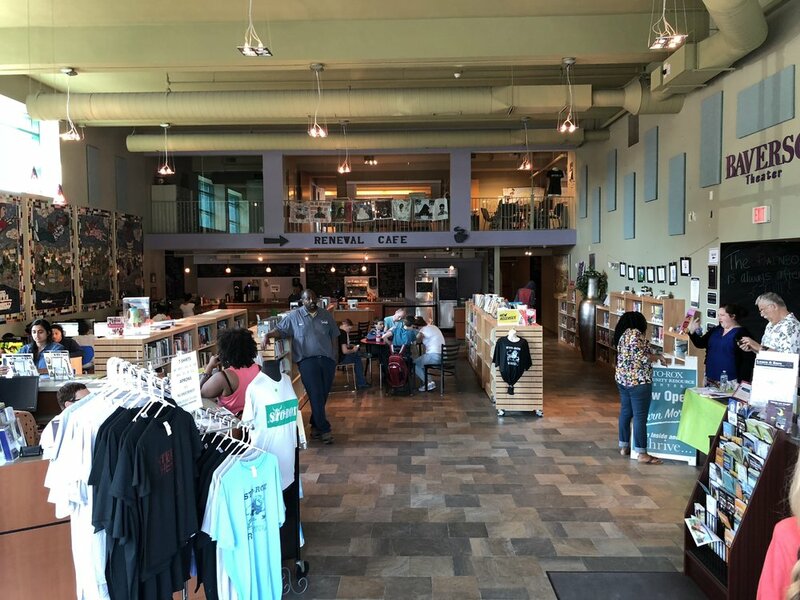 Ryan Arts & Culture Center of Focus On Renewal is a fully-accessible, multi-level facility with a vision of creating an environment that reaffirms the area’s traditions while expanding the region’s cultural and artistic opportunities. It accomplishes this vision by presenting interdisciplinary arts programming, live theater productions and unique exhibitions. WHILE YOU’RE HERE, GET A BITE TO EAT AT LOVE ROCKS CAFE! Check out the daily menu here! Ryan Arts Center creates opportunities for the community and the individual to be inspired, empowered and enlightened through the arts. Through the arts, Ryan Arts Center will foster a sense of accomplishment and hope by developing the spirit, mind and body of all who participate. Ryan Arts Center has its origins in the outcome of the 1994 Sanders Consent Decree, which sought to address discrimination in public housing throughout Allegheny County. McKees Rocks was identified as one of seven communities in Allegheny County cited in a housing discrimination lawsuit filed by Cheryl Sanders and residents of low-income public housing plans in Allegheny County. The suit charged that a disproportionate share of these housing plans were located in a handful of communities in Allegheny County. On behalf of the people of McKees Rocks, Focus on Renewal (F.O.R.) applied to The Sanders Task Force and was awarded $800,000. As the steward of the settlement funds, FOR rallied residents to determine how the settlement funds should be used. Unanimously, the community called for a place to come together and express ideas, share local traditions and grow culturally resulting in the creation of the Rya nArts Center. Ryan Arts Center receives general operating support from the Allegheny Regional Asset District (RAD), a unit of local government with a mission to support and finance regional assets in the area of libraries, parks and recreation, cultural, sports and civic facilities and programs. The Ryan Arts Center offers affordable rental spaces for all of your meeting, celebration, and performance needs! Our staff will work closely with you to prepare one of our versatile spaces in a way that accommodates the unique needs of your event. Give us a call at (412) 331-1685 ext. 320 or email krogers@forstorox.org to make a rental request or learn about rates! Great for performance, family event, conference, lecture, recital, or film screening. Rates vary by day of rental. Email krogers@forstorox.org for more information. If lighting and sound services are needed, Ryan Arts Center will provide House Technician at a rate of $35/hr. House Technicians must be paid for a minimum 4 hours of service. Any technical design elements must be submitted to House Technician at least 72 hours prior to event. If alcohol will be present in any capacity, RyanArts will provide an insured, RAMP-certified bartender at a rate of $35/hr. Bartenders must be paid for a minimum 4 hours of service. Alcohol-related requests must be laid out at least 30 days prior to event. Email krogers@forstorox.org for rental rate. Lunch area will be provided for an additional $50. Hold an Opening Night Reception in Baverso Theater for an additional $100! All other Art Gallery rentals will be suspended for the length of any exhibitions. Smart Board, computer tables & Laptops. Great for small business presentations or seminars. Pottery/Sculpture Studio:Email krogers@forstorox.org for rental rates. Unless otherwise noted, prices listed reflect minimum fee for facility usage of any length under 5 hours. Events extending beyond 5 hours will be subject to an additional $30/hr. charge to cover house management. Set-up and clean-up times are included in 5-hr base rate. If additional prep time is needed, house management costs my apply.